Bournemouth RAG introduces you to our next charity challenge! 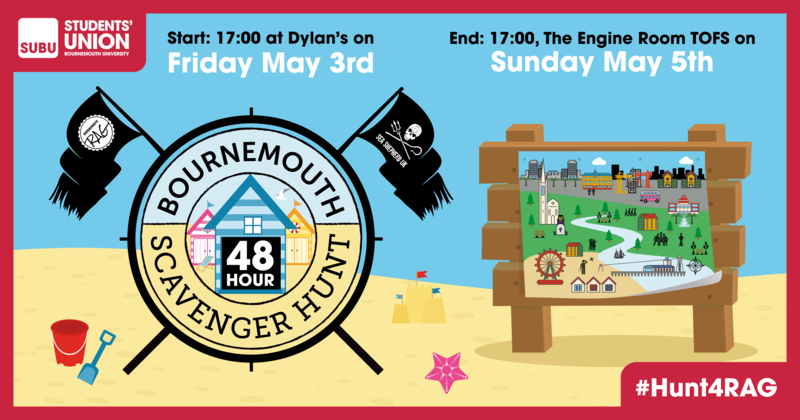 The RAG 48hr Scavenger Hunt is a collection of tasks and challenges to complete over the course of a weekend. Each task is valued with points; the team with the most points at the end of the weekend wins! The event itself takes places from Friday evening to Sunday evening, across the whole of Bournemouth! Kick off starts at 5pm at Dylans bar on Talbot Campus, and we finish at 5pm at the Engine Room in TOFS. To sign up, you need a team between 2-6 members. Each team has a £20 entry fee which you pay when signing up in the SUBU website. There is a fundraising target of £150 for each team to reach, with all of the proceeds going to our core charity of the year, Sea Shepard UK. DON'T FORGET TO SHARE YOU FINAL PAGE LINK AMONG FRIENDS AND FAMILY!